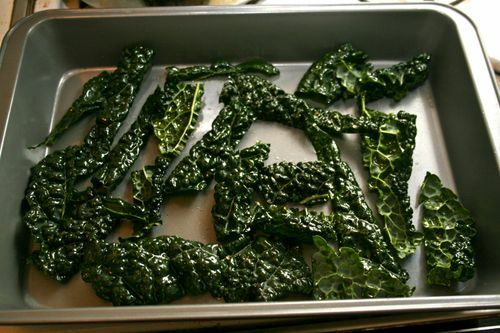 OMG, I can't believe I forogt to mention last night's kale chips! Copley and I LOVED these and now I know what to do with my weekly kale from my veggie pick-up! It's so easy and so tasty. Basically it is just a way to get salt into my mouth without eating it with a spoon. Copley is my little vegetarian (by his choice, not mine) hunting dog. This dog loves carrots, apples, green beans, cauliflower, brocolli and kale. The side effects from eating a whole head of kale? C got up at 4am badly needing to go #2 and I well, let's just say it was very sobering moment when I lifted the blankets to let him out. They were right about your system clearing out with all the fiber. Anyways, last night I baked these up and yum!! Add enough salt to anything and yum! Step One: Cut kale into chip size pieces. I cut off the stems and then cut the remaining leaf into 2 pieces. Step Two: Rinse and pat dry or use salad spinner. Step Three: Spray kale with olive oil and sprinkle on kosher salt. Step Four: Bake for 10 minutes or until crispy. I strongly recommend buying an olive oil mister. I have one from "Beyond the Olive" in Old Pasadena but I think you can grab one called Misto at most stores that sell kitchen tools. Before I had this, when I "sprinkled" OO on my food, it ended up plopping a big pile on one portion and barely getting on the other pieces. Here is my processed carb diet today. I was at a conference and everywhere I looked, animal!! I am trying to stay away from being vegan by just eating processed carbs but it's hard when at a conference. Tomorrow I will try to get to stand before salads disappear. I am going to write about The Kind Diet, the book I am following and some other topics why on this challenge in upcoming posts.